The maps on this web site show the wartime road layout and road names. The map is dated 1939 but seems to be a reprint of a slightly earlier map, because a few roads constructed in the late 1930s do not show. Click on a position on the overview map or on an area name for a more detailed map of that area. Detailed maps have UP, DOWN, LEFT and RIGHT arrows where appropriate to jump to the next map section. Detailed maps take about 30 seconds to load through a 56K modem, so please be patient. Note: Maps may not display correctly on early browsers (Internet Explorer earlier than Version 5; and Netscape earlier than Version 4.5). I am sorry, but there is nothing I can do about that. In Netscape 4.7 not all the arrows to go from map to map work: this appears to be a fault in that version of Netscape. 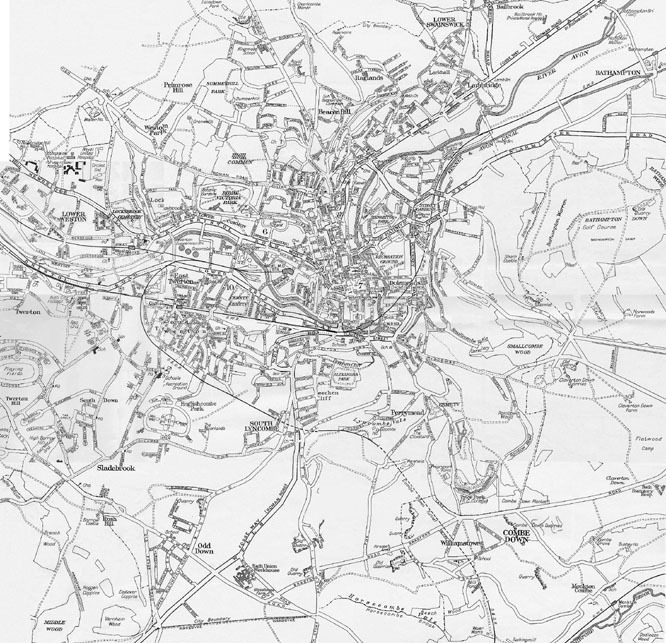 For copyright reasons, I am unable to include a modern street map of Bath on this web site. Anybody wishing to view a modern map can click on this link and then use the search facilities on that site to locate Bath.